HOFFMAN ESTATES, Ill. — Sebastian Rivera and Ryan Deakin sealed their first-career Midlands championships with solid performances on Sunday evening at the Sears Centre Arena. No. 2 Rivera’s win came with the most fanfare. He scored early and often against No. 1 Spencer Lee of Iowa, who was undefeated and had not trailed after any period in the season until tonight. Rivera notched three takedowns of the Hawkeye without being taken down once and came away with a 7-3 win over the top-ranked grappler in the nation. The victory was Rivera’s first win over Lee in three matchups over the last two seasons. No. 2 Deakin was efficient in his victory over No. 8 Kaleb Young (Iowa), using a consistent and effective strategy to log a 6-2 decision over the Hawkeye. The redshirt sophomore continued his undefeated start to the campaign and came away with the tournament title after finishing third in each of the last two seasons. 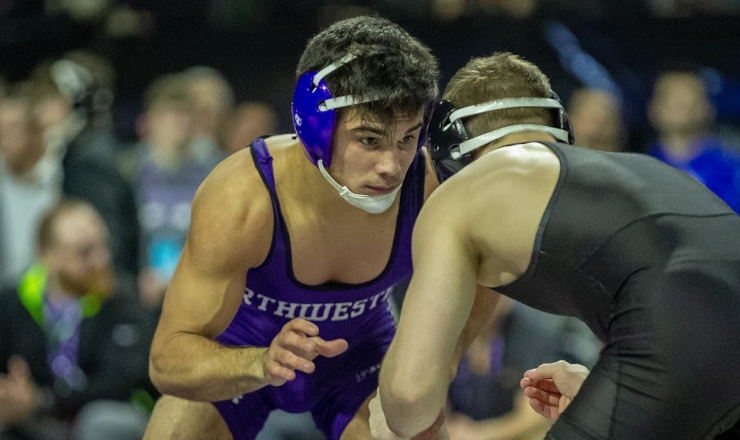 The win marked the first time that Northwestern has boasted two champions since 2011, when Jason Welch and Lee Munster both won Midlands crowns. NU also sealed its best finish in the team competition since 2014, coming in third behind only Iowa and Northern Iowa. Wrestling for third place, redshirt first-year Yahya Thomas put on a show, notching an 8-1 decision over Michael Blockhus (Northern Iowa – unattached). Thomas placed for the second-straight year, after finishing in sixth place as an unattached wrestler for the Wildcats a year ago. Competing in the event for the first time, true first-year Lucas Davison closed out an impressive weekend with a victory over fourth-seeded Rocco Caywood (Army) in the third-place match. Davison finished with a 5-1 record while wrestling unattached in his Midlands debut. NU is back in action in the new year as the Wildcats will travel to Lincoln, Nebraska, to face off against the Cornhuskers on January 6, 2019.